I’ve recently gotten into podcasts (did you know they’ve been a thing for, like, years now? 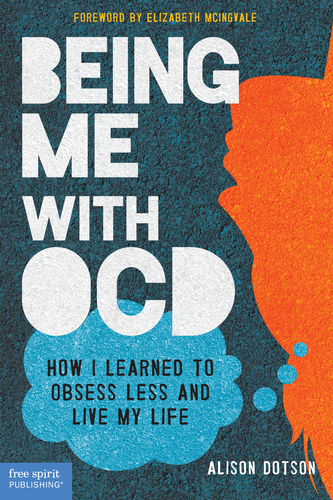 ), so I was happy to come across the aptly titled The OCD Stories, a well-done, inspirational podcast and website run by the fellow I’m hosting today: Stuart Ralph. I haven’t had the pleasure of meeting Stu in person, but I feel like I know him, at least a little, through his project. Thanks for being here, Stu, and for your thoughtful answers! You’re behind the incredibly uplifting “The OCD Stories: Real stories that educate and inspire those with OCD.” You interview individuals with OCD as well as therapists on your podcast, and you also publish personal essays. How did this all come about? Firstly, thank you. Praise is always appreciated. It came about from my own desire to read uplifting stories. As part of my recovery I started blogging on stuartralph.com/blog with the aim of sharing what was and wasn’t working for me. I found myself during spikes, as a lot of us do searching the internet for stories that relate to my own, so I could be reassured that my symptoms were OCD and not real desires, i.e., to leave my partner, or having sexually assaulted someone etc. I realized that these stories were scattered all over the internet, and I wanted to create a website where stories about OCD could live in one place. I wanted our stories to not be a source of reassurance as we all know this won’t help in the long term, but a source of inspiration and education. A place where people could talk about their struggles but also what is helping them. Recovery-focused stories. The OCD Stories was launched. A few months later I decided I needed to do more, so I created The OCD Stories podcast. I wanted to interview the greatest minds in mental health to offer the listeners good advice and also look into what the future holds for OCD treatment. It took me years and years to figure out I had OCD, and I finally got help when it seemed that my obsessions had spilled into everything and made being around even my own family difficult. How did you realize you might have OCD, and why did you seek help? Did you have any sort of rock bottom experience, or certain obsessions that seemed particularly stubborn? Like yourself it took me years also, 10 to be precise. I always felt like I was living a kind of super hero life. Not because I had any cool super powers but because I had to spend so much of my childhood hiding my weird behaviors and disturbing thoughts. I felt that if I spoke up and told my family I would be locked away for being a “nutter.” Stigma was paralyzing me and prolonging my pain even at that early age and I wasn’t aware of it. Harm OCD was my main problem growing up. Constantly have to do checking compulsions, mental checking, repetitive actions, and symmetry compulsions to stop my family being killed, innocent children in Africa being harmed or me being lost in another dimension alone. It was all very painful and frustrating, especially as I didn’t know what was happening. It got critical when BDD came into my life. I was obsessed that I was a freak because of my appearance, and that no one would ever love me. This went on for a couple years in my early teens, to the point of contemplating suicide. Most of my day was based around hiding my ears, including growing my hair and using hair products to stop it moving as to not reveal my ears. My mind at school was focused on playing small and not showing people the freak I was. In hindsight I love who I am inside and out, but at the time my mind made me believe the most horrible things. I eventually had enough and wanted to find an answer. I searched Google for answers typing in my symptoms to get multiple web pages describing the mental health condition OCD. The more I read the more I could relate. It was if they were writing about my own life. This was such a relief. I was 16/17 at this point. I finally got up the courage to call my doctor and make an appointment. I went through the NHS, and saw a psychologist. But didn’t do proper treatment until I was 27. The NHS is great, at the time mental health resources I believe were limited. As my compulsions at the time weren’t dominating every waking second I was asked to give it some time and read some OCD self-help books. If they didn’t work, I was recommended to come back and they would put me through CBT. I think my positive attitude didn’t help because I downplayed my symptoms to the psychiatrist, wanting to look like I had some control over my life. I continued to struggle for another 10 years, OCD ebbing and flowing in strength. At 27 I decided enough was enough and went privately to treat my OCD. I saw one peer support coach (Mark Freeman) and two therapists, all having positive impacts on my OCD and overall happiness. Once you were diagnosed, how did you feel, and how did you go about treating your OCD symptoms? I felt normal for the first time in my life. Understanding what it was allowed me to see OCD as the problem not me, this allowed me to speak to my parents about it. Sharing for the first time with them what had been going on in my mind. My mum went shopping with me to buy some books on CBT and OCD, it was awkward for me, but nice to not be alone any more. As for treatment I will offer advice from when I was 27 because this is when I faced my bully. I did ERP to get rid of my physical compulsions. But in my twenties my mental compulsions were stronger and more entangled than any outward compulsions, so ERP helped but I thought acceptance and commitment therapy (ACT) helped me more with the obsessions. Learning to distance myself from the thoughts and accept the anxiety and doubts, really allowed them to slowly dissipate. Adjusting my diet and exercise also helped in my recovery. Part of your stated mission is “to be a beacon of light in the moments of darkness we have all had to endure, as a result of OCD.” The stories you’ve shared has certainly achieved that. How has helping others affected your life and your own recovery? Anne Frank said “No one has ever become poor by giving.” Creating this website and podcast has allowed me to connect with so many great people, and help those who need it. The OCD Stories has given me a community which is important for recovery and a purpose. Have any of the stories especially resonated with you? I love every story I’ve had on the website. Each one has something that I can relate to, or that touches me profoundly. One person shared that a therapist had told her she was a hopeless case. That shook me. In this day and age, such statements should not be made. We must never remove hope from the equation. On a more positive note, most of the stories end on a very selfless note offering hope to the reader—this always moves me. It is a testament to the great people OCD sufferers are. What advice can you share with people with OCD who may not be comfortable sharing their stories yet? We publish stories anonymously sometimes. It’s OK if you’re not ready to use your name, I get that it is scary and can be a risk. Sharing your story I have found to be such a cathartic experience. Putting it down on paper (or word) can help you make sense of it all, and by focusing on helping the reader it can inspire you. If you wanted to share your story, I’d be happy to publish it anonymously. Or just write it for yourself as part of the healing process. You’ve been chipping away at the stigma around OCD. If you could erase one misconception with the swipe of your finger, what would it be? I would swipe away the ignorance around mixing OCD with OCPD. And since this isn’t a perfect world, what can we do to erase that misconception with the tools we actually have, bit by bit? I come from a media and marketing background. Marketing is all about perception. Same for OCD, or anything really. We can change the perception of OCD by writing, recording, and sharing accurate and positive information about OCD. So we effectively drown out all the hyped-up nonsense and misconceptions around OCD. We as sufferers, and/or therapists, can achieve this by writing blog posts, doing podcasts, filming videos, sharing our stories, or writing articles on OCD. We can even correct people when they misunderstand what OCD is in front of us. But if we do this we must remember to remain humble, and kind in our correction of their innocently naive blunder. Learn to love the question mark. When we learn to live with the doubt and uncertainty and slowly become OK with not knowing, we drain OCD of all the power it has over us. It’s not easy, but it’s possible.